In hindsight, we often think whatever happened made total sense and we should have seen it coming. But in reality, predicting the future consistently is impossible. (For example, every year I predict that the Broncos will make the playoffs…worked out great in 2015, but the last few years not so much). That said, while we would never claim to see the future, the market does give us some hints about what conditions may look like going forward. One of the most effective tools we have to project future equity returns is valuation metrics. There are multiple opinions about this, but as illustrated in the charts below, there does seem to be some predictability, as time passes. 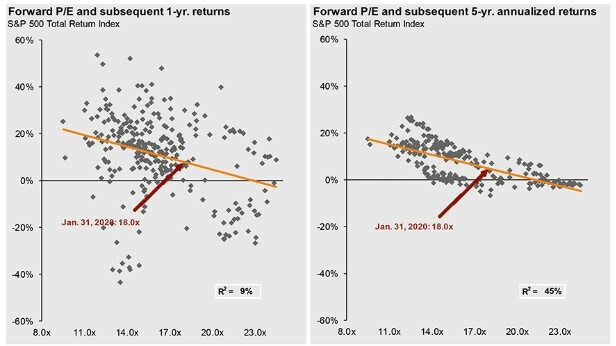 As you can see from the chart on the left, using valuations to predict one-year returns is essentially throwing darts at a dartboard. However, move out five years, while it certainly isn’t perfect with an R-squared of 0.44, things become a lot more consistent. Source: J.P. Morgan. As of 12/31/2018. The current P/E of 14.4x is below the average over the last 25 years of 16.1x. This is a change of over 2x from Q3 2018 driven by the steep sell off we saw in the 4th quarter. Taking that number and projecting five years out, it suggests five-year returns for the S&P 500 Index will be at, or just under, 10%. At the depths of the financial crisis, P/Es were around 9x which corresponds to around 16% annualized returns. Looking at annualized performance for the S&P 500 as of 12/31/2018 for the last 10 years, the realized returns were just about 13% which while slightly lower, are in line with what we would expect (and there weren’t many observations with starting valuations that low either). The problem with these numbers is that our minds hear an 13% average and we expect this to be delivered in a linear fashion; but that isn’t reality. The S&P 500 Index was up 26% in 2009, but only 2% in 2011. It was up 32% in 2013, but only 1.4% in 2015. People hear a number and when the market doesn’t do exactly that every year, they assume the numbers are worthless. But as time passes and returns smooth out, these numbers are often pretty good indicators of what will happen with sufficient time. In addition to expecting linear returns, we often neglect the ranges. For example, maybe we expected 7% over five years and the market ended up returning 15%. Many might have said it was foolish to use P/Es, missing the fact that 15% was actually in the range; granted it was not what we would have given the highest odds, but it was certainly within the realm of possibilities. 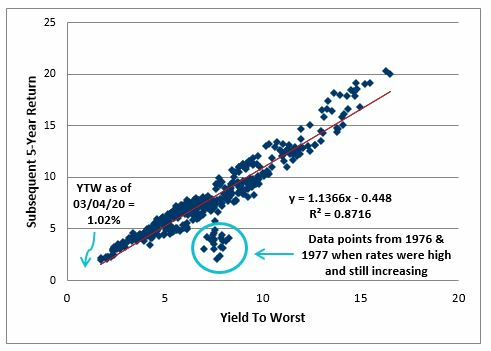 Let’s see what fixed income markets are telling us as current yields are also very predictive of future returns. As of the end of October, the yield on the 10-year was 2.69%—corresponding to a return under 3%. Source: Bloomberg & 361 Capital. As of 10/31/2018. While no one is claiming these are full proof predictions, using P/Es and current yields are some of the best tools we have and are some of the building blocks investors use to build their capital market assumptions. See below for a compilation from a number of well-known firms and their predictions going forward. 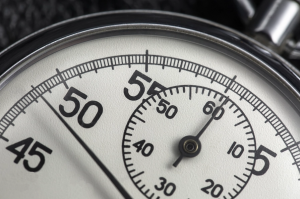 While every firm has their own methodologies and, in some cases, different time frames, the clear theme is that go-forward expected returns are lower than we’ve been accustomed to historically, but certainly over the last decade. From 1926-2018, U.S. large cap stocks have annualized 9.5%, with U.S. investment grade debt annualizing 4.83%. That gets us a nice healthy 60/40 portfolio of just about 7.5%, historically. After subtracting a bit for inflation and advisory fees, it is a pretty safe assumption to stick to the historically accepted 4% withdrawal rate (never mind that is a time frame of over 90 years…slightly more than most individual investors’, I imagine). Now look at what the aggregate expectation is for the next five to ten years, which is lower across the board. The average 60/40 using these expectations would earn about 4.8%—but once you remove some for inflation and advisory fees, and if you plan on withdrawing 4%, you are going to be losing money every year on average. Another consideration for investors is the sequence of returns, as this can be very impactful to an investor’s experience and could ultimately affect whether they can achieve their goals or not. 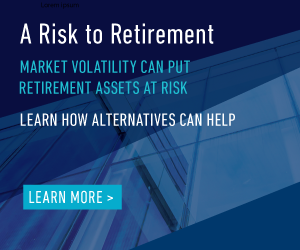 Large declines in asset values in the early years of retirement can be especially problematic, and as discussed before, returns do not arrive in a linear fashion. 2. Increase risk in your portfolio. As you can see from the returns above, emerging markets have the highest expected returns, so shift more of your allocation there. One thing to note though is that volatility is often much higher in emerging markets so be sure you and your clients are ready for some swings. 3. Decrease client expectations. 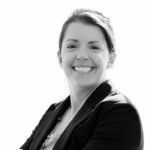 Start having discussions with clients now about their expectations in retirement and see what adjustments might be warranted (e.g., what will they need from their savings, consider whether they should increase contributions now and/or perhaps delay retirement). We will talk more about the last point in the next part of our series, but for now, take a look at your current portfolios and examine whether your allocations will help clients achieve their goals on a go-forward basis should we have a sustained period of low returns across multiple asset classes.